You can find live music at one of the town’s historic venues just about any day of the week, but if you really want to experience the best of the music scene, check out one of Red River’s many festivals throughout the year. Red River Songwriters’ Festival was founded in 2012 by a group of songwriters and musicians. Since then, this event has grown in popularity and regularly sells out, so plan ahead and get your tickets early for this one. The event is built upon “music, love, friendship, food, drink, and the celebration of music and song,” and you can expect solo shows, duos, impromptu collaborations, and late night jams, as well as a grand finale by the founders: Drew Kennedy, Josh Grider, Walt Wilkins, Susan Gibson, Brandy Zdan, and Kelley Mickwee. January also happens to be prime skiing season, so you might even see a musician out on the slopes for an early morning run! This festival was started more than three decades ago by Michael Martin Murphey, who was key in getting the music scene in Austin going nearly 50 years ago. 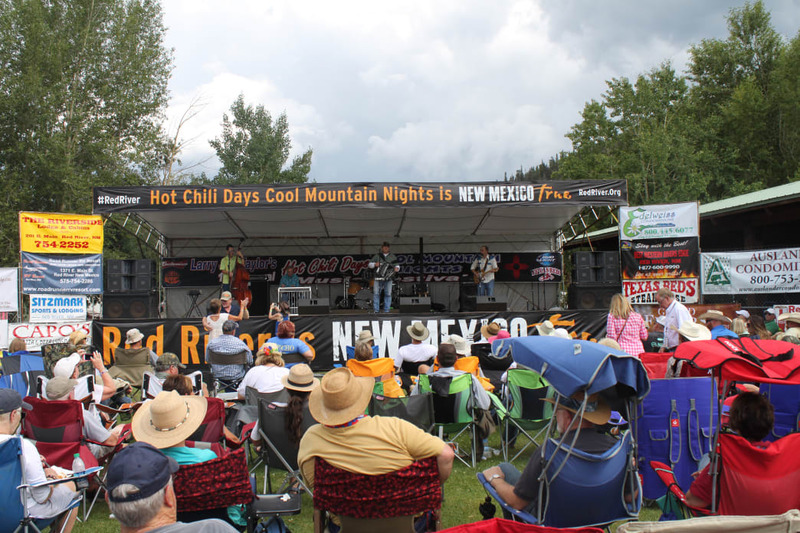 The event in Red River is a celebration of “the arts, culture, and music of the Old and New West” and has been called one of the best festivals in the country. 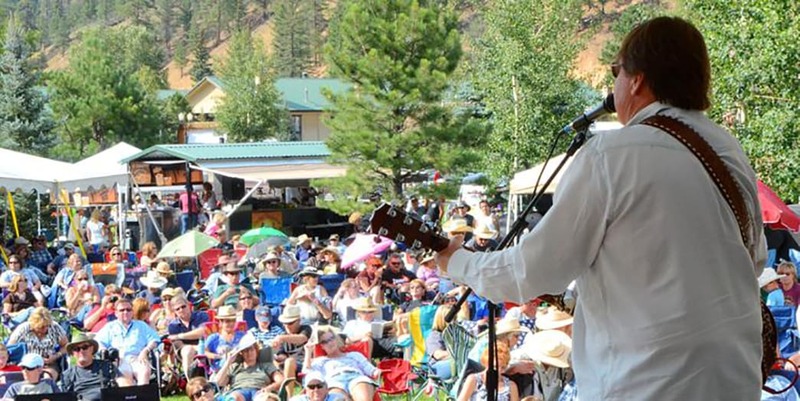 With music including contemporary and traditional country and Western music, Western swing, new age, Americana, jazz, bluegrass, old-time folk, and gospel, there is something for everyone at this epic three-day event. One of the best things about the music scene in Red River is that even when big names come to town, the events have a small-town vibe. At Larry Joe Taylor’s Hot Chili Days, Cool Mountain Nights Festival it’s not uncommon to see a musician hanging out in a lodge, pickin’ away. Bring your own guitar and you just might be able to join them! There are plenty of scheduled events at venues around town, too. You may come for the music, but you’ll stay for the cook-offs. New Mexicans take their green chile very seriously, so be sure to stick around for the New Mexico State Green Chile Championship. The Chili Appreciation Society International (CASI) Cook-Off and the Lone Star BBQ Cook-Off are other popular events during the festival. Every year, this fun event showcases some of the country’s best musicians—and even a Grammy nominee from time to time. The festival has been an annual tradition for more than 40 years, featuring bluegrass, old-time and American bands, instructional workshops, dancing, and contests. The event is usually held in September and you can get the festival pass or a single day ticket. Tickets are sold at the door but will go fast, so get there early. Locals will tell you that the Red River Folk Festival dates back to 1963 when Rick Fowler, Wayne Kidd, and Ray Wylie Hubbard came to town, but it’s only been around “officially” for a couple of years. The festival has a motto “of the folk, by the folk, and for the folk,” and it lives up to it. Music is held at venues all around town for four days in September and the festival coincides with the Aspencade Arts and Crafts Fair. There are also plenty of ways to get outdoors in and around Red River, so you’ll have no problem filling your days with things to do. Held during the first week of September, the Dulcimer Festival is a celebration of music played by this unique instrument. Traditionally, the dulcimer is from the Appalachian Mountains but this festival is all about sharing the history and music of the folk instrument. There are workshops offering lessons on singing, how to play an instrument and shape notes, as well as teaching festival-goers about dulcimers, bowed psalteries, autoharps, mouth blows, penny whistles, and more. You can borrow instruments to try them out and all concerts and workshops are free. This is a great opportunity to not only enjoy music but to learn about and even play something new. Red River has made quite a name for itself over the years as a music mecca. Whether you’re planning to come enjoy the music first and the beautiful surroundings second or the other way around, this mountain town on the Enchanted Circle Scenic Byway is worth a stop.